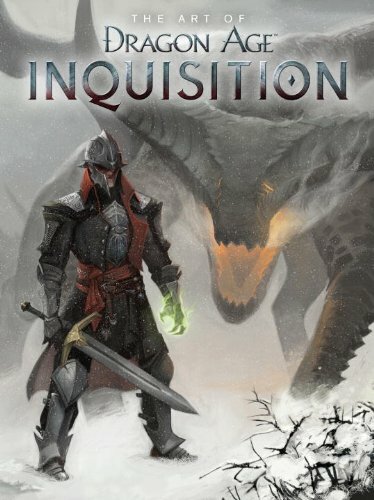 The Art of Dragon Age: Inquisition is a large hardcover artbook that's much thicker than I expected. Although it's listed at 184 pages on Amazon and publisher Dark Horse's website, the book's actually 264 pages. That's an additional 80 pages! Collected within is a huge amount of beautiful concept art created for the game. There are designs for characters, props, landscapes, storyboards and some story scene paintings. More specifically, you'll see castles on hilltops, cavernous throne rooms and interiors, exquisite carvings that adorn the walls and ceilings, props such as thrones designed to reflect power of the rulers, faction banners, ancient ruins in deep jungles and other mysterious places imagined by the artists. Even the few screenshots of locations in the game looks great in terms of lighting and mood. The design is very cohesive. Character designs are mainly influenced by medieval warriors in armour. The book includes many variations of costumes and characters. I prefer the environment and prop art to the character designs although they are pretty good as well. There are some creatures and dragons but not much. The captions that come with the artworks talking about the designs are quite insightful but too brief. The style of art is mainly painterly, quite detailed at times to show off the architecture and history of the places. There are some rough pieces but for the most part they look wonderful in terms of textures, composition and invite you to marvel at the details. The recent video game artbooks published by Dark Horse are all pretty good, including this one. Considering the extra pages, amount of content and quality of the art, this is certainly fantastic artbook for fans of the game and fantasy art. Good value for money.